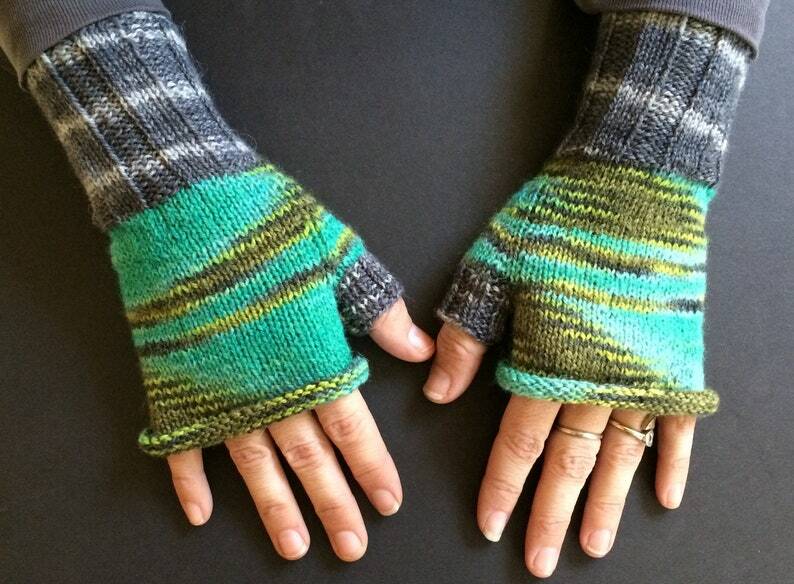 These funky, warm fingerless gloves with a rolltop are vibrant, soft, and colorful. The greenish-turquoise yarn reminds me of actual turquoise stones. The gloves have gray wrists and gray thumbs. Size: Approx. 6.5" long, 8.5" circumf around top of hand (not including thumb). Care instructions: Hand wash with mild detergent (Woolite, for example) and lay flat to dry. Do NOT put in dryer. I hand these gloves them using double-pointed needles, so they have no annoying seams. The vibrant, textured yarn is hand-painted in Peru and consists of a mixture of merino wool, Alpaca, and silk blend (60% merino wool, 20% silk, 20% Alpaca). Keep your fingers free to work, craft, and write, while keeping your hands warm. You’ll feel like you’re living in Dickensian England when wearing these!